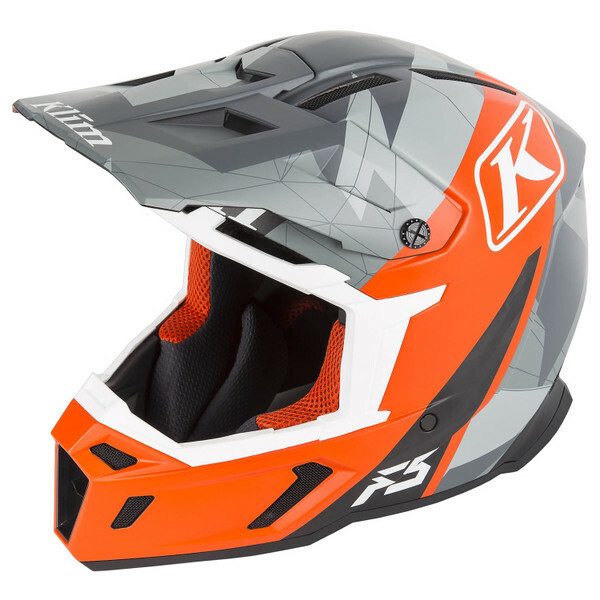 The new KLIM F5 Helmet: Unbeatable comfort and a revolutionary ventilation system! Unbeatable comfort and a revolutionary ventilation system! Rider feedback, test data and cutting-edge technologies are integrated into this revolutionary helmet. The combination of extremely low weight, intuitive ventilation and next-gen safety features makes KLIM’s new F5 stand out. It provides maximum wearing comfort all day long even under the most demanding conditions. • The most efficient ventilation system: 18 inlet openings and 8 outlet openings, which ensure optimal heat dissipation at any speed and even when stopped. • Large, wide field of vision that gives the off-road goggles enough space. • FID-LOCK® STRAP lock: a magnetic lock makes it easy to put the helmet on and take it off. The helmet is available in 4 attractive designs (orange, black, green and red) in sizes from SM to 3XL at the recommended retail price of €499.00. Just right for one of the lightest helmets on the market – KLIM’s brand new VIPER goggles with roll off - more about this coming up soon!